Our FAQs section is designed to answer any questions youmay have. Hopefully you will find the answer to your query here but if not feel free to contact us. 1.) About the prices quoted ? 2.) About the delivery ? 3.) Can I have your holiday extras delivered to a different address than my own ? 4.) How do I pay ? 5.) What’s happens if I cancel my order ? Cancellations ? 6.) Would you be able to find something not listed on your website ? 7.) About the guarantee ? 10.) How far in advance do we need to reserve the equipment ? 11.) About the safety and cleanliness ? 12.) What happens if I arrive late at night or early in the morning ? Or depart later or earlier than pickup ? 13.) Is there a minimum hire period ? 14.) Do you require a security deposit ? 15.) What about batteries ? 16.) Can I get a reminder service for my order ? ? 15.) What are your delivery hours ? 16.) How far in advance do I need to order ? 17.) Can I trust your team to pick up my products and fresh foods ? 18.) Do you supply any other of baby food ? 19.) Can I purchase Alcohol ? 1.) About the price quoted ? All prices include local taxes . We operate 7 days a week. We deliver across the Algarve. We provide a delivery and collection service for your convenience, as detailed below. Delivery charges also include collection from the same address. Yes. During the checkout process you will be asked for your delivery address. Simply change this address to the one you wish to have the delivery. Your selection will be delivered to the location you enter. We accept credit cards - Pay Pal or cash. Where a booking is cancelled due to circumstances beyond your control we try to be understanding and reasonable. If not all orders cancelled within 48 hours of a delivery date will incur a charge equal to 50% of the original order. We will try to fulfil specific requests, please contact us. If for any reason you are not completely satisfied with any product, service from us, we’ ll promptly make things right with a replacement or a full refund. We recommend you reserve as soon as possible to make sure we have the items in stock. We understand that you only want to use good quality equipment that is in pristine condition, from leading brand named manufacturers. It is sanitised and checked for safety after and prior to each hire. 12.) What´s happens if I arrive late at night or early in the morning ? Or depart later or earlier than pickup ? Our delivery hours for this service are from 8 am to 9 pm, Monday to Monday. When you make your order, reservation mentions your arrival and departure date /time. For example if you are staying in a Villa/Apartment, when possible we will arrange with your contact (Rental Agent, friend or family member ) to have access to the Villa/Apartment before your arrival so that everything is set up and ready to use. For late departures we can arrange a later pick-up. For early departures we will again need access to the accommodation to pick-up the hire items. Please mention this on the order form. Yes. Our minimum hire period is one week. Yes, for all hired items .Please at your checkout time add our security deposit. If you pay cash, this deposit will be refunded on your collection upon satisfactory inspection of the equipment hired. If the payment is made by credit card - PAY PAL. The refund will be made at the end of the hire period and upon satisfactory inspection of the equipment hired, we will credit the deposit amount to your credit card, within 3/5 working days. We will provide one set of batteries, if your hire requires batteries. Ifmore batteries are required. you will be responsible for the purchase of batteries during your hire period. 16.) Can I get a reminder service for my order ? Yes, an email reminder will automatically be sent to you 48 hours prior to the delivery of the Equipment. Our delivery hours for Groceries/ Food Packs service are from 8 am to 8pm. Monday to Monday. 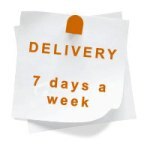 Generally we offer next day delivery. We do however recommend placing your order several days before your delivery date. We must have time to pick up out and prepare your groceries in order to offer the highest level of service. Absolutely ! Our team will shop for your products and fresh food just as if they were shopping for themselves. Yes. We supply most leading brands of baby food. We believe in keeping our children safe and without addiction. Because of this, we will ask for ID, when delivering your purchases that may contains alcohol.